33 Then Pilate entered the headquarters[i] again, summoned Jesus, and asked him, “Are you the King of the Jews?” 34 Jesus answered, “Do you ask this on your own, or did others tell you about me?” 35 Pilate replied, “I am not a Jew, am I? Your own nation and the chief priests have handed you over to me. What have you done?” 36 Jesus answered, “My kingdom is not from this world. If my kingdom were from this world, my followers would be fighting to keep me from being handed over to the Jews. But as it is, my kingdom is not from here.” 37 Pilate asked him, “So you are a king?” Jesus answered, “You say that I am a king. For this I was born, and for this I came into the world, to testify to the truth. Everyone who belongs to the truth listens to my voice. Christ the King is the last Sunday in the church’s liturgical year. We start the year with the anticipation of Advent, and the abay at Christmas, and then journey on through the year until we reach the stage where we celebrate Christ reigning as King. I just want us to think about what it means to celebrate Christ as King, especially in the light of these words : My kingdom is not from this world. In Christian religious art we see a recognizable Christ figure, as an earthly king, a king after the fashion of this world complete with crowns, swords, orbs and sceptres, and thrones, the trappings of earthly power , dressing up the metaphor in ways that we can understand. And that is a problem for us. Firstly it characterises God in Christ as the exercise of power. Secondly it makes God absolute and tyrannical for that is what the ancient concept of kingship was about. The concept of kingship when this art was created, is that of absolute monarchy, the divine right of kings, and in ancient times even the deification of the king. Thirdly, and more subtly, it takes away the idea of relevance to you and me. Even today, Kings and Queens are distant and over there, unreachable and aloof. Ironically also, today they are almost always powerless, so far from tyrannical and obsolete, they are symbolic constitutional remnants, important in a subtle way, but all powerful? Certainly not. We may admire and even love our Queen, but she is actually relatively powerless. Today we live in the area of “constitutional monarchy”, and we too easily think of Jesus as a constitutional monarch, one limited actually by our own sovereignty over ourselves. Jesus Christ did not come and die to change the mind of God about miserable humans. He came to die to change the minds of miserable humans about God. 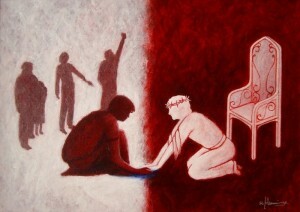 Jesus showed us the power of God to change human beings, Jesus loves us into change, not forcing us into compliance. You will obey Christ as king for one reason only – not because He will make you, but because somewhere deep inside you choose to do so because his love compels you to do so. The power that is assumed and demonstrated is not the power of compulsion, but the power of transformation. We become changed, not compelled. Therein lies the difference I never stop stressing, between a living faith and a dead religion – the latter believes in non-existent King, the former in a living ever present Jesus. King George VI was one of our best loved 20th century Kings. Why? Because against all the odds he led the country in war, contrary to his own personal wishes,and definitely contrary to his own good health, he became the king we needed in the time of national crisis. But he came to the throne in very specific way. For this man to become king, another had to abdicate the throne. For the right King to reign, another King had to leave. Christ comes to be king in a similar way – not by might or power or by imposition – but the king of your personal life needs to abdicate and make way for him. At that point, he literally gave his life in service to you. Christ is not asking you to obey him against your wishes, or live a life self hating misery, or spend your days wishing you could be doing something else. He is inviting you into the God of love. It is not for his benefit, but for ours. 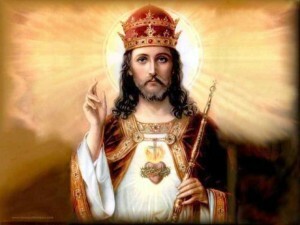 Christ the king is an invitation, a challenge, and a revelation of a better way of life. However, this king doesn’t conqueror invade, he does not impose himself or break down the door,; this King stands at the door and simply knocks, desiring to be invited in to sit down and eat with us.